This past Saturday, I had the privilege to attend for the second time BarCamp Charlotte. This was the 7th iteration of this event – designed to bring together technologists, artists, startups, politicians, and generally speaking, anyone who was interested in using whatever they are most passionate about for improving their communities. Being that it was visit #2 for me, I took some additional interest in attending and trying to do a few things different this time around. BarCamp is run in an un-conference format. After some general introductions, and pointing out where the coffee and pastries were located (this started 9AM Saturday), the rules were set and things got started. You had 30 seconds to pitch your idea for a talk. At the end of the pitches – anyone could pitch – there would be voting. The voting took place by each topic getting a large swatch of paper and each person being asked to vote for their top two topics. After the voting, the tallies were counted, and the top 12 pitches were granted 45min in their own room to talk on their topic. For the morning and afternoon (after lunch) this happened – with six topics going on at at time. The morning was a bit slow getting started. You could tell that there was some uncomfort in the early pitches. Compared to my last time there – where I pitched something in the second half – I came ready with a pitch. I got one vote for my topic "How to Draw in Meetings and Not Get Fired." That was a bit discouraging, but there were several other pitches which were much better, and granted me some time to do what I intended on coming to BarCamp for – sketchnotes. The last time at BarCamp, I noted my impressions by sketching each session that I attended. That made for some neat conversation on Twitter, and some of those people I maintain a neat conversation with on Twitter and at various meetups around Charlotte. I wanted to let my art pull the same kind of response this time, and hopefully also see if there’s a market here for people who can take a topic and draw graphics that make sense in relating what could be complicated points. Anyways, back to the sessions. The first session I attended was a discussion on Mobile Frameworks by Luis Casillas. While the talk really focsed on his love of toolsets (specificlaly jQuery Mobile), there was some discussion about other frameworks such as Sencha Touch. Questions from the peanut gallery (eh, that would be me, not everyone else there), pointed to other relevant topics such as Adobe Shadow, responsive design, Modernizr and other templating systems, and Drupal. As a matter of Drupal, the kid (really, he was around 15-16), was bat-crazy about Drupal. Was really neat seeing him go at things on his laptop, then check what Luis was saying on his Android phone. Really interesting future that kid has. The second session was definitely a change of pace. This was a session on Writing, Publishing, and Things to Know When Making Your First Book by Tamela Rich. Compared to other talks that I’ve attended around this subject, I liked Tamela’s way of first giving a story as to how her first book was composed and published. In the midst of the story were those finer points about writing, getting a team together, and marketing that you usually hear in a more bullet-point manner. After her story – of which I got a nice set of notes from – she fielded questions about the process, prospects with ebooks, and social networking. Initially, I wasn’t sure what that session would be about, but I came away with a unction to get to writing a book (or several). There was lunch after that. Lunch is an interesting time for BarCamp. At the first one I attended, I noticed how the crowd changed during that time. Some people left, many more people showed up. The same thing happened this time. While getting my stomach filled on the complimentatry lunch, I had a neat conversation about big data, data visualization, and digital efforts in theology with a former IBMer. Probably one of the best convos I had throughout the day. IBM folks are filled with a perspective and knowledge about a lot of stuff that just matters on a immediate global scale. After lunch we gathered back in the larger room for pitches again. As many noted on Twitter (#barcamp), the pitches in for the 2nd half were much better than the first. Part of that has to do with people being more awake (!! ), but also that there’s just that sense of people knowing better what’s going on. I was a good bit discouraged from my 1-vote pitch earlier, but ended up doing a second pitch. I had no clue about the topic either, nor did I say anything of what I was rehersing in my head as I walked up to the mic. Nevertheless, my pitch ended up getting enough votes to become a session, and I was added. I will say that I did ask the organizers for a favor of moving me out of the second half of the afternoon talks. There was one person who’s pitch using Genghis Khan was so impressive that I knew I didn’t want to miss it. They moved me, and that gave me all of 5 minutes to invent a presentation on a topic I wasn’t quite ready to talk about in that manner to at leats 11 people who wanted to hear it. As mentioned by one of the people attending, this is quite similar to what goes into creating infographics, graphics, and data visualization. And it wasn’t like those topics weren’t on my mind (re: the lunch convo), but I was more interested in taking down some of the mental barriers many who have tablets or some creative ability to taking that skill of drawing and making it valuable beyond self-sketching. A few neat tools were talked about in addition to those I mentioned – YMUL sounds very interesting (mentioned by Luis) and speaks directly to the non-graphically-gifted-but-excellent-coding developer. I enjoyed the interaction and feedback from the talk – and was extra wigged out when I realized that reps from three of the companies sponsoring the event attended my talk (yikes, was my hat on straight). The fourth and final session I attended was by Kevin Hale, and tited "How to Run A Startup Like Genghis Khan." What intrigued me most about this talk was the association of history and sociology to a topic that rarely sees that intersection within many media circles (really, you’re not reading a story titled that on TechCrunch at all). We were taken through a historical analysis of the truth of Khan’s efforts to wage and win war campaigns, and the steps that startups (and their founders) should be moving towards as well. It helped that Kevin is a co-founder of Wufoo and has taken many of these steps. Again, a throughly enjoyable conversation. And at that BarCamp was technically over. Not long after that last talk, much of the crowd left for whatever was left of their Saturday. I managed to wrangle a few more conversations – and hopefully found some avenues worth exploring in the near future. There was also an afterparty at a local resturant not too far away and so I made sure to attend that one (got a neat hand-sewn hat from the folks at MailChimp and a few other items + more free food). The conversations had at the afterparty were actually a lot more intense than at BarCamp, which was good – and it definitely was something to make sure that I had my game up all the time when talking about Mobile Ministry Magazine, my art, or other aspects of life, faith, food, and politics. As you can probably tell, I enjoyed BarCamp Charlotte 7. I would definitley encourage you to find similar events in your area and make those connections (TED, TEDx, Ignite, BarCamp, Mobile Monday, etc.). Besides being just a neat place to connect with like-minded folks, it offers you an ability to experiment with your public self. For me, it reemphasized how much better some things come out of my mouth off the cuff (my poetry is similar), and how art can be a connector when its made accessible to what people do or don’t already know about themselves. After that, its all about getting your passions sparked, or sparking it in another. 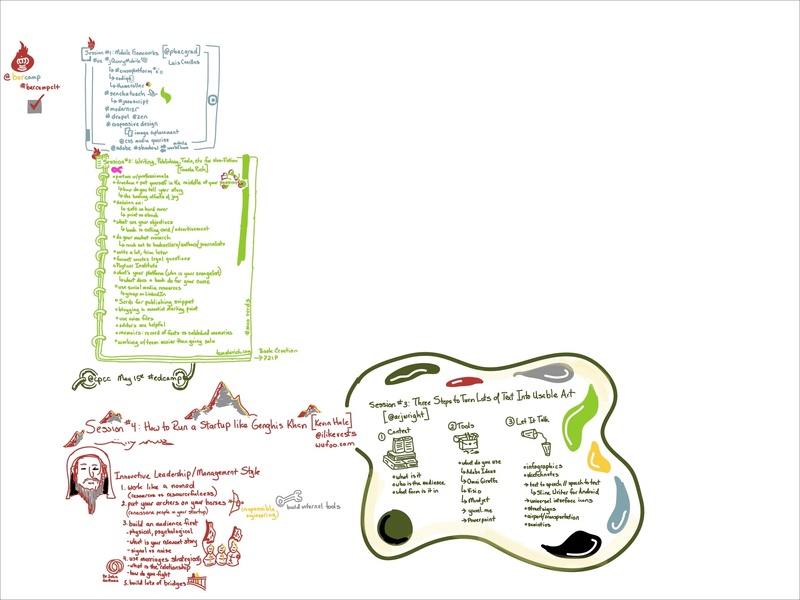 By the way: if you would like to take a look at other sketchnotes, you can see the gallery by going here. If that’s something that could benefit you or your team/learning community, get in touch and let’s talk on how to make that happen.